Voters in three California cities and one in Colorado will decide next month whether to slap a special tax on sugary drinks like soda and sports thirst-quenchers after costly, high-stakes campaigns that are pitting healthy-lifestyle advocates against the beverage and grocery industries. Health advocates argue that raising the price on beverages sweetened with sugar will reduce consumption and ease the nation’s exploding rates of obesity and diabetes. The soda industry maintains there’s no proof of that. Cities that need cash liken a tax on soda to other “sin” taxes such as those on tobacco and alcohol. But grocers argue that a tax will drive customers to stores elsewhere. And the beverage industry, which fears reduced sales, says it already contributes $13.6 billion in state taxes across the nation each year. Next month’s votes in San Francisco, Oakland and Albany, California, and Boulder, Colorado, come in the wake of a penny-an-ounce soda tax in Berkeley, California, that took effect last year and a 1.5 cents-an-ounce tax in Philadelphia that is slated to take effect in January. Much is at stake for the nation’s $169 billion non-alcoholic beverage industry, as other localities that are strapped for tax revenue are watching the outcome for a sign that increasing the price on soda, which nearly half the public drinks daily, would be acceptable. The soda industry spent at least $40 million between 2011 and 2014 fighting soda taxes. This year, it has spent nearly $10 million to fight the San Francisco tax alone. On the other side, former New York Mayor Michael Bloomberg, whose tax on large drinks in his city was thrown out by the courts in 2014, has put in about $500,000 of his own money to support the San Francisco measure, part of the roughly $2.6 million that has been raised by advocates altogether there. In Boulder, tax proponents have put in about $700,000, while opponents have put in about $500,000 to defeat the measure. The effect of the taxes appears to vary, depending on where and how they are imposed. “Creating new taxes on soda will reduce purchases of soda in that area,” said Scott Drenkard, director of state projects for the Tax Foundation, a nonprofit that studies taxes. “That’s the law of demand. A recent University of California, Berkeley study showed a 21 percent drop in consumption of soda and other beverages containing sugar in Berkeley’s low-income neighborhoods in the months after the tax was implemented in March of last year. In San Francisco and Oakland, whose voters will decide on a tax Nov. 8, there was a 4 percent increase in consumption of the drinks in the same time. 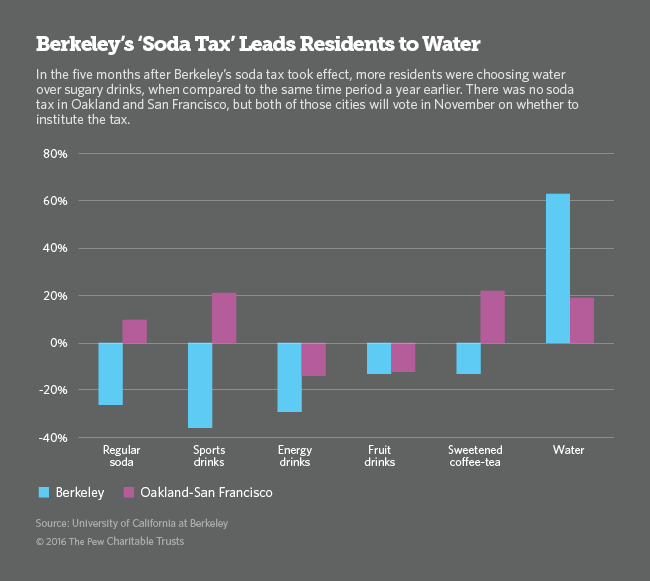 Jen Falbe, a research fellow at the university’s School of Public Health that conducted the study, said water consumption went up 63 percent in Berkeley in the months after the tax took effect and that higher prices on sugary drinks deterred some customers from buying them. But a study in Mexico by the Autonomous University of Nuevo León found that Mexico’s 1 peso-per-liter tax (about 5 cents) on sugary drinks instituted early in 2014 reduced consumption by only 3 percent and had “no significant impact on the average caloric intake of people in Mexico.” The tax, the report said, had a greater impact on poor households. A study by three professors from Ohio State and Cornell universities conducted in 2012 found that a tax on sugared beverages tended to lead to more beer being bought by households where beer was regularly purchased. As a result, the study concluded, caloric intake wasn’t reduced. Arkansas, Tennessee, Virginia and West Virginia have long-standing laws that tax sugared drinks, according to the Tax Foundation. In 2011, 14 states proposed an excise tax on soda but none was implemented. Over the past eight years, Dermody said, there have been 43 attempts to tax soft drinks that have been rejected by city or state legislative bodies or thrown out by the courts. The proposed San Francisco soda tax would impose a penny-per-ounce levy on sugar- sweetened beverages such as soft drinks, sports drinks, iced tea, juice drinks and energy drinks, as well as on syrups and powders that can be made into the beverages. Exempt would be diet drinks, milk and beverages that contain only natural fruit or vegetable juice that don’t have sugar added. The Oakland and Albany measures are similar. Grocers and beverage distributors in San Francisco argue in an advertising campaign called “Don’t Tax Our Groceries” that, to comply with the soda tax, stores would impose the higher taxes on all the food they sell because it is too much of an accounting problem to single out one group of products. Advocates of the tax, like campaign consultant Larry Tramutola, scoff at the argument. “In California, there is no tax on groceries,” he said. Philadelphia’s new tax will also sweep up diet drinks and beverages sweetened with substances other than sugar. The tax will add 1.5 cents per ounce to the cost of most sugary and diet beverages starting in January unless a lawsuit filed by the beverage and grocery industriesprevails in throwing out the tax before it takes effect. But Anthony Campisi, spokesman for the Philadelphians Against the Grocery Tax Coalition that is funded by the beverage industry, said the tax will hit working families and small businesses the hardest. Middle-class shoppers can find another nearby area that doesn’t impose the tax to do their shopping, he said, while “people who live in the poorer sections of the city who don’t have a car” don’t have the same choices. Shanin Specter, an attorney for the beverage and grocery coalition, said there are other problems with Philadelphia’s tax. Pennsylvania law says a locality is not allowed to tax something that the state already taxes. Soda is not taxed in Pennsylvania if it is sold in food stores, but it is subject to sales tax if it’s sold in restaurants or is dispensed “ready to drink” from a fountain. Secondly, he said, Pennsylvania’s constitution requires that all taxes be uniform. “Because this tax is on volume and not value, there is an enormous discrepancy between the taxes depending on the value of the product,” Specter said. For example, a customer buying an iced cappuccino at a coffee shop will pay no more than an 8 percent sales tax. But a customer could pay a higher rate of tax on a bottle of cappuccino from a store because the tax is imposed by the ounce, not by price. Finally, he said, the tax may run afoul of the federal SNAP, or food stamp, program, which does not allow localities to tax SNAP benefits. States that tax food don’t tax purchases made with food stamps. And, he said, the Philadelphia soda tax does not make an exception for soda purchased with food stamps.